Performance is the act or process of carrying out or accomplishing an action, task, or function. But in the fitness world, performance is usually associated with athletes and some sort of sport specific skill. Every person, every day performs actions, tasks, and functions but not everyone is performing these tasks as efficiently as possible. The concept of achieving peak performance still applies to the average Joe (and Jane) when it comes to implementing a proper exercise prescription. If the average Joe is training for a dodgeball tournament he is going to learn how to dodge, dip, dive, duck, and dodge. But if Joe is just training for life he is going to learn how to squat, hinge, push, pull, and carry. The human body should move well and it should move often. If you can dodge a wrench you can dodge a ball, and if you can hip hinge you probably can lift some pretty heavy weight. Point is, the ability to use different mechanisms to adapt to forces is key for performance of smooth, coordinated movement patterns. Essentially, resistance training is the force we place on an object but also the force the object places on us. So how can we enhance our performance by improving our force production? Get really good at performing human movements. Find a balance between mobility and stability in our multijointed movements (squats, hinges, presses, pulls). You can place more weight on poor movement but that will only decrease our force production. Build a solid foundation first. Lifting heavy produces muscle tension and activates more muscle fibers. Get good at lifting heavy weights and your body will become more efficient in activities of daily living. Preloading is the tension developed by just fighting gravity. Before you move the weight, you must lift the weight. Get out of the habit of only using circuit machines! Our proprioceptors provide feedback as our muscles lengthen and contract. The muscle recruits more and more fibers as the muscle lengthens to perform the concentric aspect of the lift. If the eccentric portion of the lift is taken out, the muscle will not reach its full force potential. Another reason why range of motion is so important! Improve force production and improve performance. The ability to apply and absorb a force directly relates to quality of life and injury prevention. Don’t be afraid to step out of your comfort zone! Lifting weights is for everyone! 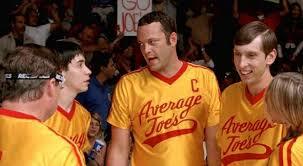 Strive to be an above average Joe and give Globo Gym a run for their money ?